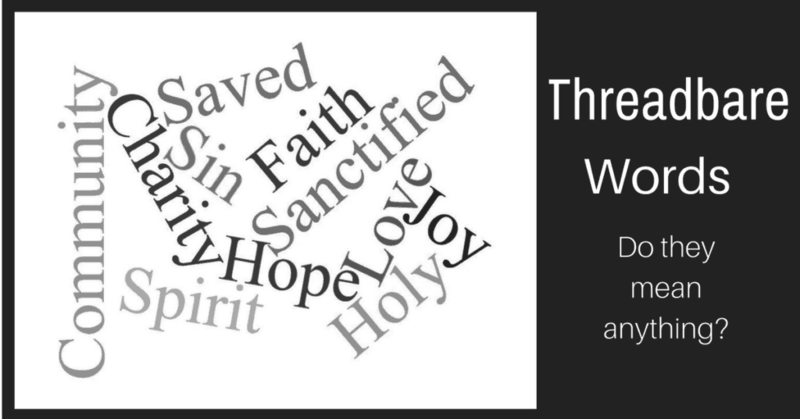 I don’t know about you, but I think we overuse many “spiritual words.” Words like HOLY, JOY, or BLESSED. In attempts to demonstrate our faith, we’ve depended on spiritual jargon to tell who we are and what we believe. With overuse, so many of those words have lost their power, and honestly, most people don’t really know what they mean anymore. In May, I’d like to take those thin, worn-out words and see if we can put new flesh on them. I want to examine their real meaning, consider their overuse and, finally take a fresh look at them through the filter of a 21st century mind to discern if they’re still relevant. I think I’ll begin with the word HOPE. When Can I Stop Trying to be Perfect? I’m so hard on myself. 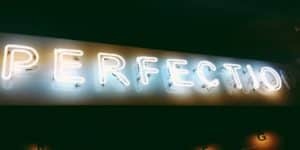 I’ve always struggled with the idea that I must be perfect. It’s partly from my childhood, but partly just who I am. Others can make mistakes, but I cannot. If people could hear the negative self-talk that goes on in my head – they’d be shocked. I seem to have a difficult time accepting God’s love, I guess it’s because I don’t feel I’ve earned it. Have you felt this way? It’s like I have this idea of who I think I’m supposed to be, the perfect LISA. I’ve learned, that as I attempt to be the perfect LISA, I am missing out on the real LISA. My ideas of perfection get in the way of knowing who I really am. Most of us carry around a whole bunch of expectations on ourselves. We believe the lies we’ve been told about who we are. We accept without examination the labels that others have placed on us. How refreshing would it be to rid yourself of these obstacles to true Self-Knowledge? Would you like to free yourself from the lies and labels that hold you back from experiencing God’s love, even if you aren’t sure you deserve it. Spiritual Direction can help you shed the lies and labels. Would you like to enter into a new way of seeing yourself? Let’s begin the journey. My mother. Just before I was born. She was 20. 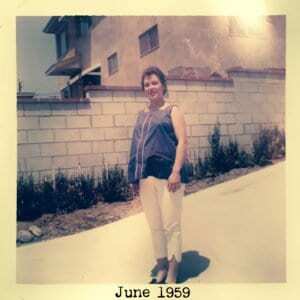 I know I write a lot about my mother, but her faith had a profound effect on me. She died of cancer when I was 28. Odd to think, I’ve lived half my life without her. She had a strong faith in God, one that I didn’t fully understand until she was gone. While she lived, I was spoiled. I could tap into her “god-connection” anytime by simply calling her. When she died, I was forced to figure out this god-guy on my own. In one respect it was hard, and in another it was easy. I had to apply myself. I had to ask hard questions. And I had to accept harder answers. Everything I thought I knew was challenged, and she was no longer available through a simple phone call. In my search, something remarkable happened. As I reached out to God for answers, He reached back to me. I didn’t expect that. I figured that having a faith was like most things in my life, I’d have to depend on myself to get it accomplished. But as I opened myself up to God, He was faithful to meet me in my confusion and help me along the way. Are you finding the answers to your questions? Are you looking for a new way to hear God. Take a look at my Resources. You might find something that will help. Drop me an email if you have something specific you’d like to discuss. Or visit my Spiritual Direction page and we can begin a discussion. I have often been asked if Spiritual Growth is really possible? How do you stay motivated to grow over time? How does Spiritual Growth actually occur? How can I cultivate Spiritual Growth in my daily life? The “how”s of Spiritual Growth are different for each of us, because each of us are different. What works for one, may not work for another, or it may not work – yet. Spiritual Growth takes time and does not happen by accident. It is the process by which we move forward, gaining an ever-widening understanding of who God is, and who we are in relation to Him. The goal of Spiritual Growth isn’t to become someone else. The goal is to become the best version of yourself. It is accomplished over time and involves patience, study, and the intentional application of what has been learned. Yet, the real work of Spiritual Growth is done by the Holy Spirit – the active agent of any change. How He changes us is something I cannot explain. I can only tell you what has happened in my own life. My Spiritual Growth has come about through a multitude of situations, people, and lessons I would have otherwise avoided. I have found there is an aspect of humility in Spiritual Growth that cannot be escaped. And that humility exposes our Willingness. Willingness to let go of my opinions, of my preferences. Willingness to move outside of what is comfortable. Willingness to admit I don’t have all the answers. Willingness to talk less, and listen more. Willingness to go deep inside. Willingness to ask hard questions. Willingness to accept hard answers. Willingness to suffer while striving to remain blameless. 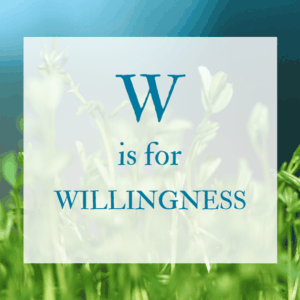 Willingness is all that the Holy Spiritual really needs to change you. He will accomplish the mystery of the inner work; your job is to cooperate with Him. Interested in exploring your Willingness, or lack there of?? I’m the perfect person to talk to, as I’ve struggled with that myself. Drop me an email with your thoughts. In “U is for Unknowable,” I threw out the challenge that God, in the end is, unknowable. This caused a bit of a stir, so I thought I’d keep the conversation going. Now, it isn’t that God wants to be unknowable, the limitation lies in me! Hard as I may try, I can never “think” as He does, never see things as He does, never understand things He as does. He is without beginning or end. He exists outside of time and space. I’m a weak, broken creature, constrained by time. My understanding of everything is affected by this reality. I’m made in His image, but I contain within myself only a small remnant of knowing what that means. God is not my equal, He is my creator. It is because of this inability to really understand God, that Christ became a man and lived among us. By His words and actions, Christ attempted to show us who God is, how He thinks, and what is important to Him. But God’s effort to reach us didn’t end with Christ. We have the example of those who have journeyed before us, we have the traditions of our faith, and Sacred texts. Yes, I said texts – plural. The first one is obvious, The Sacred Texts of Scripture, the inspired Word of God. The Text of the Inner Self, well that’s really fascinating, and I’ll save that for another post. In this piece, I want to focus on the third text: The Text of God revealed in Nature. In nature, there are hints of God, everywhere. I’m not only talking about the deep beauty found in nature, I’m talking about the way our physical world points us to a greater understanding God. As a Spiritual Director, I often hear, “Lisa, I want God to speak to me.” I get it, I was there too. I wanted the big, booming voice, to speak loudly and without hesitation. But I’ve learned that God is speaking to me – all the time, it just took me a little practice to “hear” Him. Through the years, I’ve taken several exercises designed to help with listening, and created a worksheet which shifts this listening into seeing. It’s called “Visio Divina,” or Sacred Seeing. If you use this worksheet a few times, you’ll be off to a new way of “hearing” God in everything you see around you. Even if you’ve never thought it was possible for you. Visio Divina is a tool that will help you let God find you in a new and creative way. I hope you’ll give it a try. Once you do, drop me an email and let me know how it went. I have always found it encouraging to know that we are not alone on this journey to God. There are many who have traveled the road before us and they have left us an abundant supply of tools to utilize in our own efforts. Our lives should be devoted to learning all we can, striving always to know more about God. BUT, there is an inherent limit to our learning. For hard as we may try, God is beyond our understanding. He is, in the truest sense – Unknowable. As I began my Spiritual journey, I committed myself to learning all I could about God, His ways, His desires, His plans. As my understanding of God grew, God grew. As my understanding of His love and mercy grew, His love and mercy grew. Without realizing it, I was defining God based on my understanding of Him. Then my daughter suffered a brain injury which left her cognitively diminished. Her understanding of God changed. As I observed this shift, I realized God didn’t change, only her understanding of him changed. His power was not diminished because her lack of understanding or belief. I realized then that this must be true for me too. God was not limited by my understanding of him. He is larger than what I can know, larger than what I can experience. If my cognitive functions become diminished, God will not change, only my understanding of Him will change. Always the search after Christ. Never knowing whether Christ is found or not. Living for the truth, but having to make acts of faith about it. Sharing the life, but feeling dead. If you desire to grow Spiritually, you must be willing to accept this truth. In the end result, God is unknowable. This may require full abandonment of what you think you know. And in this abandonment two things are required: humility and trust. In trust, you follow God. … often knowing not where He is leading, nor even who He is. Simple? No, but I believe this is the essence of faith. Wrestle with it, and let me know what you think. Exploring the lives of Saints has allowed me to enter a fullness in my Spiritual life. I have learned from so many who have traveled on the path of faith before me. St. Teresa is one of those Saints. Her life is a wonderful example of how persistence in faith bears much fruit. Like Julian of Norwich, Teresa of Avila lived in a time of great turmoil. Interesting to consider that we will avoid struggle and turmoil at almost any cost. We’d rather run away, self-medicate, or live in denial of our problems. Yet, we have so many examples of how struggle and turmoil can be catalysts for great seasons of Spiritual growth. This honor was due in large part to her exceptional work, “Interior Castle.” While in prayer Teresa saw a vision of the soul shining like a crystal, she set to write the vision as an explanation of our journey to God. Originally written for the nuns under her direction, “Interior Castle” holds deep truths for those who desire Spiritual growth and union with God. The journey to union is one of self-knowledge. In her writing, the inner self is likened to a crystal mansion. Each chapter takes the reader deeper and deeper through seven mansions into the inner chamber of the soul, where Christ, in glory, awaits them. A little later this week I will be releasing information about an opportunity to join an intensive journey to God through Self-Knowledge. The lessons and exercises hold many keys to self-discovery. Send me your email address with the box below, to get valuable information as it becomes available. Retreats and Silence go hand-in-hand. Retreats create the space for Spiritual Growth, and SILENCE is the language of Retreat. I know that seems odd; silence as language, but silence is the language of God. Regular periods of silence play a significant role in Spiritual Growth. The type of silence I am speaking about is not the mere muting of the noise around us. No, it is an inner condition of our very beings; stillness, quiet, calm. There are also elements of desire and anticipation in this type of silence. Can one move long the journey in faith without silence? I suppose, but if you want to GROW spiritually, you must submit yourself to silence. As an extrovert, silence has not come easy to me. I wrote about my initial experience with silence, in D is for DISCERNEMENT. But, once I tasted the fullness of emptying myself in order to be attentive to God, I could not go back to the way things were. In this silence, my Spiritual Growth expanded in ways I never could have anticipated. After my husband died, I submitted myself to a ten-day retreat of silence and solitude. At the Siena Prayer Center I met with a Spiritual Director for 1 hour each day, and we discussed what God was revealing to me. It would have been very easy to stay home, and keep busy with all the things that I needed to take care of in the wake of this tragedy. But the time alone with God was so very rich and full of the comfort and clarity I needed at that critical time. 1 hour per week, 1 day per month, and 1 week per year. This silence business is nothing new, and there are tools to help you enter this silence. Drop me an email if you’re interested in learning about them. A word for Introverts: the silence that is needed here is not your regular experience of inner quiet. You must be attentive to something outside yourself. You must go deeper, or go sideways. The external quiet may come easy to you, but there must exist in it, longing and anticipation. A word for Extroverts: at the onset, silence may be difficult for you, but you must push through what feels like loneliness. Do not be afraid. Create the space, and be still. God will speak to you, you are not alone. Regardless of your temperament, observing silence does get easier with practice. And I can PROMISE, you will never regret seeking God in silence. If you know me, you know I love to retreat. I attended my first retreat in 1991. I was nervous, and it was difficult to leave my family, but I knew I needed to get away. At that retreat, new doors were open to me, as if, in the pause, I was given a new set of glasses, and the whole world looked different. I don’t retreat to escape the world. I retreat to fuel myself for the world. I retreat to return to the quietness I was designed to enjoy. I retreat to practice hearing God’s voice. I retreat for the space I need for God to change me. I retreat because it is good for my soul. If you desire to grow spiritually, you must retreat. If you are new to retreating, I suggest you begin with a “led” retreat. Attend with friends, or make friends at the retreat, but commit to observing some solitude during this time. God is longing for your attention, give it to Him. If you are a seasoned retreatant, I challenge you to try a private, self-directed retreat. Bring only your Bible, a journal and an open heart. Let God lead you. Here is a link to locating a retreat center. I have retreated in the mountains, the desert, at churches, and in hotels. The location isn’t as important as actually committing to a retreat – Just Do It! I’ve created and led over 40 retreats. I have attended dozens more as a participant. So, I know a thing or two about retreats. Below are my top three “Dos and Don’ts.” I hope they give you the motivation to seek God in a retreat setting. A retreat leader will usually spend a fair amount of time preparing for your retreat. It’s good to follow their lead. Push yourself outside of your comfort zone, and try their exercises and reflections. However, give yourself permission to follow God’s lead as well. As a rule, I say, follow the leader, unless you specifically feel God calling you to something else then, follow Him. Outside our regular environments we tend to be more attentive. Open your eyes and look. Look for patterns, connections, and symbols. As you practice this type of “seeing,” you will begin to become more attentive at home. Our lives are so focused on doing, and getting, and achieving … at your retreat practice being. Often I will cover the mirrors and clocks while I’m making a retreat. I try not to concern myself with my physical appearance or external schedules. In a culture where we are preoccupied with ourselves, it is freeing not observe myself, and just be present to what is going on around me. A retreat is not intended to provide you the opportunity to catch up on your bills, or thank-you notes. Don’t encumber yourself with things to-do. Give yourself to becoming better acquainted with the part of yourself you neglect. Leave your cell phone in the car, or keep it in airplane mode. If you’ve made a commitment to retreat, be present. If you have people at home who might need you, limit yourself to checking your phone once a day. Yourself, the retreat leader, the food, the accommodations – nothing. God will use whatever He is given to teach you something you. Humility is of paramount importance in Spiritual Growth! 2. ordinary or everyday, especially when mundane. 1. the condition or quality of being secret, strange, or difficult to explain. 2. a religious belief based on divine revelation, especially one regarded as beyond human understanding. I admit it, I’ve felt this way too. I remember the first hint. I had just left the corporate world, to begin a life as a stay-at-home mother. I loved what I was doing, but it was hard, physically and emotionally. I found great support in a women’s Bible study at a local church. In this Bible study, I learned about the exciting events of the early church; miracles, shipwrecks, foreign cultures. But I was bound to the daily grind of diapers, bottles, and temper tantrums. I felt that my gifts were meant for more than managing the bodily functions of two active boys. I recall a specific moment, rocking my colicky son, gazing longingly out the window, I thought, “Surely God, I’m meant for more that this?” And in that moment, God gave me no such assurance. Not what I was hoping to hear, but an idea that has been a significant motivation for how I do, what I do. I like this idea, even the most ordinary objects of the monastery are to be treated in the same fashion as the sacred altar objects. This is something I can imitate. Every diaper changed, every dish washed, every memo sent, or spreadsheet created … every boring, mundane act, can be performed as a sacred act of worship. Most of us are not called to a life in a far away, exotic place. Most of us are called right where we are, in the middle of the mundane, everyday life we’re leading. And like the Benedictine cellarer, we can enter the mystery of the Quotidian, and see the redemption of all things, even our daily tasks.